I like watermelon. I love Hello Kitty. But, the red of this kind of looks like some sort of ritualistic scarification. 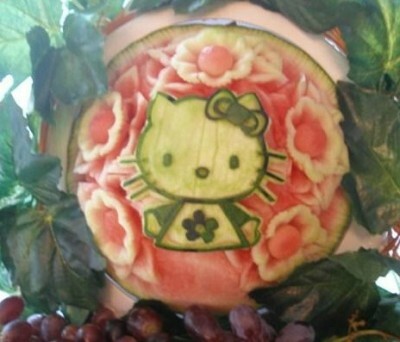 I can’t get comfortable with this kittified watermelon. I need directions for this. 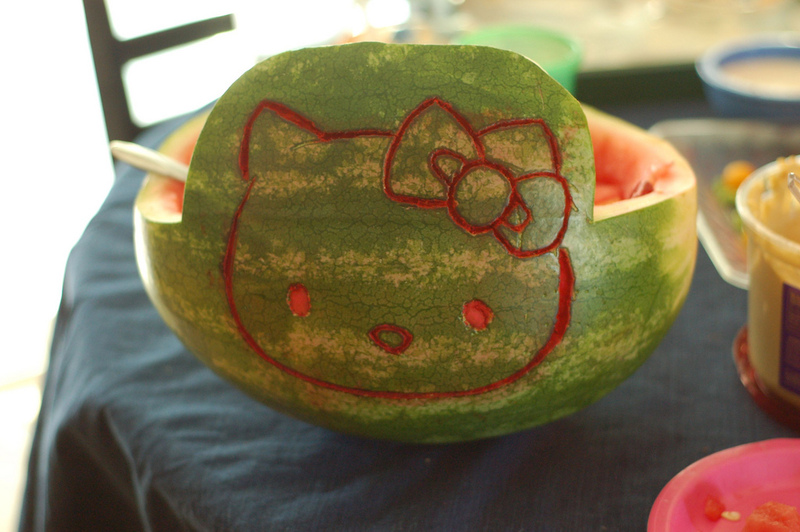 I carve a nice Hello Kitty pumpkin every year so I’m sure I can pull this off. But I’m only confused on one part, is this carved or scraped? I always suspected she was a cutter. @Sandra – If you right-click on the picture and select “open link in new [tab|window]” you can get the pic zoomed up full-size. Some bits of the cutout are obviously V-grooved so must have been carved in. Others are U-grooved and I’m not sure how to do that; the nearest tool I’ve got is a zester and that would create lots of small corrugations in the base of the cuts. I love this and think it’s a great idea to replicate for a b’day party or even a HK themed baby shower. Surprisingly, I opted to not have a HK themed shower for my baby girl this wknd but I will definitely do this for her 1st B’day! The red makes her look evil. well i like hello kitty but this makes me think of a big sacrifice ritual so who is gonna draw the pentagram and who will help me hunt her down…….. jk OR AM I????? ?